there are no plans to implement the SWT API with JavaFX. So there would be no reuse with existing SWT code. But Using a good JavaFX render for the Eclipse 4 application model would be a good starting point for Eclipse 4/JavaFX based applications. you can use any version of JavaFX with e(fx)clipse, see http://efxclipse.org. You just have to set the JavaFX location in the Eclipse JavaFX Preferences. Maybe you are interested and wish to contribute some interesting ideas too. Eclipse/FX actually is a promising combination. Actually, http://efxclipse.org has very good JavaFX OSGi support. Take a look at the OSGi example. Just installed JavaFX v2.1 B14 on my system, on an application I’m working on the difference in text rendering is great compared to JavaFX v2.0. But what mystifies me is that the text I have for all my tabs is still aka JavaFX v2.0. However, when I look at your screen shots your text is crisp and sharp in the tabs, I wonder why that is? Surely I shouldn’t need to do any additional tweaks, right? It depends on the graphics card driver if LCD text is rendered with sub-pixel anti-aliasing. What graphics card do you have? I like this improvement, too. 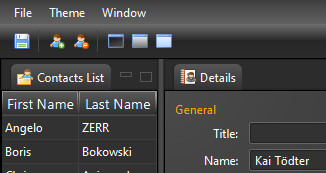 Does JavaFX take hinting for rendering small fonts into account? My GPU driver is up to date. Ah… any ideas, please? I am aware of the list of supported GPUs. Is there any hack how to skip the validation? Hi, I found you article while searching on Google. I don’t know what’s going on with JavaFX 2.2 (included in JDK7u7) but the font rendering is definitely not good, both on Linux and on Windows. It might be better as it was previously, but it’s not using the system font rendering (from Xorg or Cleartype). 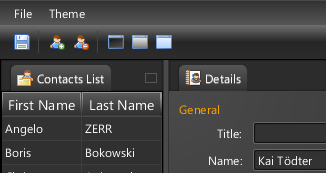 Is there a way I can force JavaFX to render font using the system settings?